At no charge, your cookbook may contain two different recipe indexes —an alphabetical list of recipe titles by section, and an alphabetical list of contributors’ names. This appears near the back of the cookbook. Table of Contents— Every book will contain a table of contents listing the starting page numbers of each food section. Section titles will match dividers. 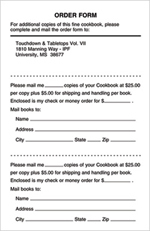 Mail Order Page— A mail order page is a great selling tool, to assist in fundraising— readers will have all the information they need to order additional copies directly from your group. This page will be placed at the back of your book, between the indexes and the helpful cooking hints section.